It was an unexpected sight, in Yellowstone National Park, but having severely sub-par cell service the past two days couldn’t even stop us from seeing them. There was no visible green glow or anything, but the eery gray streaks sweeping across the northern sky were visible to the naked eye. I quickly pulled my RX100 out of the glove compartment and clambered over the middle console of our Yaris and into the driver’s seat. Ian was already out of the car with the a7 mounted to his tripod. I opted for the meager warmth our Yaris could offer with its front window rolled down all the way. My first shots were crap, from a photographer’s perspective, but the colors were absolutely amazing. To start, I’d quickly flipped my dial to ‘M’ and prepped for a 6-second exposure. No tripod. Just handheld. Propped atop the open window frame of the driver’s side door. With some expected star streaking from my unsteady hand in my first few exposures, I made some minor adjustments — adding a 2-second timer, using the tilt screen to more steadily prop my camera up on the window ledge — and was rewarded with better results. My final improvement to my set-up was turning the car’s engine off and setting the e-brake (Ian never does) to keep car movements to an absolute minimum. And I was quite impressed with my results! This photo was taken on June 22nd with the Sony RX-100 III. Continue to view full photo. The Aurora isn’t normally visible as far south as Yellowstone, which is why we hadn’t even thought to try to check its forecast. 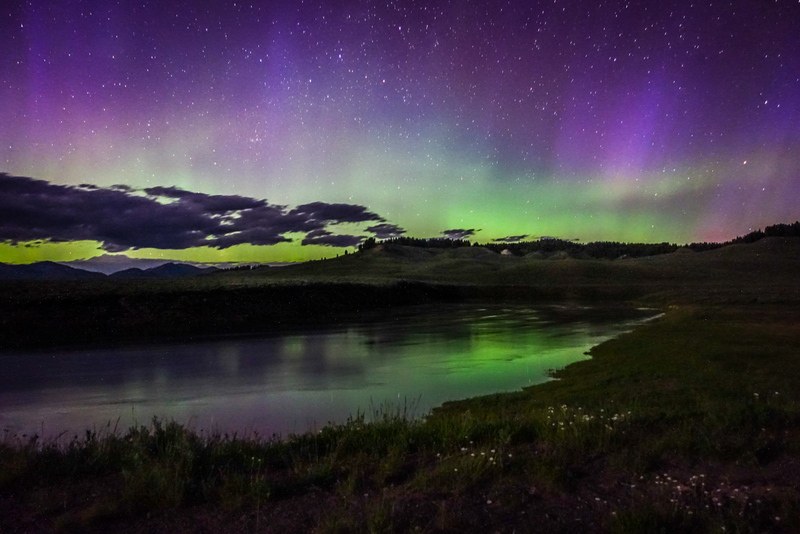 It was a perfectly unexpected Aurora Borealis sighting. We got lucky, staying up late to shoot the Milky Way and ending up with a sight even rarer — and more colorful! Lucky, too, that Ian happened to be looking in the direction opposite of the Milky Way to see it. Have you ever seen the Northern Lights? Where were you and what was your reaction when you first saw them? This post was handcrafted especially for you during our travels in Minneapolis, Minnesota on our summer 2015 U.S. road trip.